Dax is already turning bullish, but will it last? Stock markets have been on a bullish trend for three months since they made the big reversal at the end of December. The uptrend has been quite straightforward since then with only one decent pullback lower at the beginning of February, which means that the buying pressure has been pretty strong. But, we are seeing another decent pullback right now. In fact, we’re seeing a bullish reversing chart pattern in the German DAX now because the pullback took place during the second half of last week. The sentiment in financial markets turned negative last week after the FED turned neutral from hawkish on Wednesday and stock markets dived. Yesterday we saw stock markets make some new lows during the Asian session but the price reversed back up. The day closed just above the opening price, but at least the sellers didn’t make new lows yesterday and neither did today. Yesterday’s daily candlestick closed as a doji which is a reversing signal, so we think that indices might turn hawkish now. 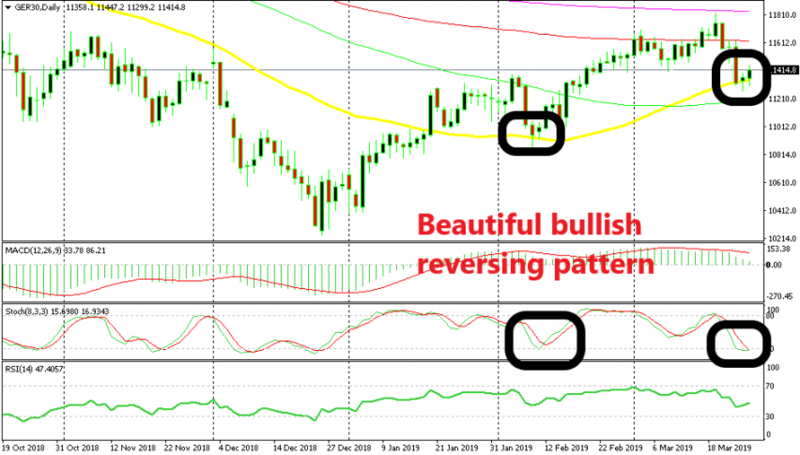 The daily chart is oversold now as the stochastic indicator shows and above all, the 50 SMA is providing support. The price has pierced it a couple of times but the candlesticks didn’t close below it, neither yesterday nor today. This is the perfect bullish chart setup and today’s candlestick looks pretty bullish too. But, the problem is that fundamentals have turned dovish now, so the price might turn bearish pretty quickly at any given time. This is why we have been reluctant to go long on Dax now. But, we might, depending on how the price action of the next few sessions will be.